“Palmo” and “Foldable” have won the world’s oldest and most prestigious design award, the 2017 GOOD DESIGN ® Awards presented by the Chicago Athenaeum Museum of Architecture and Design at the same time, and both products are now part of the Museum’s Permanent Design Collection! ECBB CO., Ltd. (Address: Shibuya-ku, Tokyo, Japan. 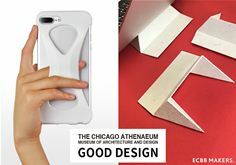 CEO: Yasuhiro Matsuura) has won the two 2017 GOOD DESIGN ® Awards presented by the Chicago Athenaeum Museum of Architecture and Design (hereafter referred to as Chicago Good Design Award) with “Palmo”, an iPhone cover for easy one hand control, and “Foldable”, the world’s lightest and thinnest mobile stand for smartphone, tablet and laptop, produced and sold by “ECBB MAKERS.” a makers department of the company. This design award is internationally well known as the world’s oldest and most prestigious design award, and “Palmo” and “Foldable” are now accessioned into the museum’s permanent collection. The Chicago Good Design Award is one of the world’s most prestigious design awards presented by the Chicago Athenaeum Museum of Architecture and Design in US. The design award was founded in Chicago in 1950 by the former MoMA (Museum of Modern Art / New York, US) curator Edgar Kaufmann, Jr., together with modern design pioneers such as Charles and Ray Eames, Russel Wright, George Nelson, and Eero Saarinen. The history of this design award is longer than that of the three greatest design awards in the world, such as the reddot design award in Germany (since 1955) and the International Design Excellence Awards (IDEA®) in US (since 1965), and thus it’s internationally recognized as the world’s oldest and most prestigious design award. For 2017, the Chicago Good Design Award program received the submissions from several thousands of companies/firms, including FORTUNE 500 companies and the world’s foremost design/graphics firms, from over 50 countries, and only those who met the world’s highest criteria set by the jury were awarded for its design excellence. “Palmo” is an iPhone cover made of Silicon, which gives you “One Hand Control” and “Drop Prevention” with just one finger, and would protect your iPhone by “Impact Resistance/Protective Performance”, should you drop your iPhone. In the trend of growing demand for these three factors along with the increasing size of iPhone, “Palmo” has seen through the essence of the problems and provided the smart solution. On top of that, “Palmo” has many other functions, which are designed from comprehensive perspectives, such as the ergonomics design of the three-dimensional organic curve, the iPhone-friendly design to prevent smartphone from heatstroke and to protect the battery life from wearing out by increasing its heat release, and the human-friendly design considering the effects on the smartphone disease of our time such as text thumb injury and text neck from a scientific viewpoint. For the simultaneous achievement of these various kinds of functions, “Palmo” is highly evaluated domestically and internationally. “Palmo” has won the Japanese most recognized design award, the GOOD DESIGN AWARD, in 2015, and the world’s most prestigious one, the reddot design award (Germany), in 2017. This time, as the winner of the Chicago Good Design Award, “Palmo” is now the one and only iPhone cover awarded by these three design awards in the world. “Foldable” is the world’s lightest (15 gram) and thinnest (0.8 millimeter) mobile stand. This product is made of “Kurotani Washi”, the first class/traditional hand-crafted Japanese paper with 800 years of history in Kyoto, Japan, also listed as Kyoto Intangible Cultural Property, and is designed based on the Japanese traditional “origami engineering”. “Foldable” is the world’s first product that fused the tradition and the latest, applying the Japanese traditional culture and technique into a modern gadget, such as a mobile stand for laptop, smartphone and tablet. “Foldable” has both of the world’s lightest portability and the sufficient strength as a mobile stand at the same time. For carrying, it exercises the best portability in the form of two dimension like a paper, which can fit even into a laptop. For using, it transforms into three-dimensional and take the “truss structure”, used as the basis of architectural engineering, resulting in the astonishing robustness, which we believe will be far beyond user’s expectation. “Foldable” as a laptop stand is designed friendly to both of human and laptop. The ergonomics design induces the most natural typing posture to human body and achieves both of reducing the stress on body and increasing the efficiency to work at the same time. The space between a desk and a laptop enhances the natural convection of airflow and the heat release from a laptop, which contributes the decrease of burden to CPU (Central Processing unit), the prevention of battery deterioration, and the prolongation of battery life. “Foldable” can function as a stand, not only for laptop but also for smartphone and tablet. In addition, the new versions of “Foldable” are planned to be released in 2018. One is colored by “Sekka Shibori”, the Japanese traditional tie-dye technique. Another is more optimized for all of smartphone, tablet and laptop. “Foldable” has been named as a Featured Finalist in 2017 by the world’s most prestigious design award, the International Design Excellence Awards (IDEA®) in US. With the Chicago Good Design Award of this time, “Foldable” is now the unique mobile stand recognized by these two design awards in the world. This is the world’s most prestigious international design award by the Chicago Athenaeum Museum of Architecture and Design in US. Its history is as far back as 1950, and now it’s known as the world’s oldest design award. There are participants from approximately 50 countries around the world every year, and the applications cover a broad range from products to graphics. The criteria value, in particular, the quality design of form, function and aesthetics. ECBB MAKERS. is the makers department of ECBB Co., Ltd., which has been providing Web solutions/Electronic Commerce website developments since 1999. It branched out into Hong Kong in 2011 and expanded to Shenzhen in 2012, and then had been exploring ways to make products there since 2012. Based on the knowledge and know-how cultivated like this, ECBB MAKERS. is globally operating the planning, design, development, manufacturing, and marketing of the original products. All products will be produced and sold around the world, i.e., Japan, the English-speaking countries, EU countries, the Chinese-speaking countries, etc. In addition, ECBB will approach the development of IoT (Internet of Things) products in cooperation with its existing business of web application/web site/system development. ECBB will be creating not the commodities destined to be chosen only by price and function, but the products that can color our lifestyle and then enrich our life itself. As of today, it’s been 18 years since ECBB started as IT company. In 2015, ECBB launched its makers department aiming at the international success. The first product “Palmo” was released in Hong Kong and Thailand first, and then spread to US and EU, already getting worldwide. ECBB will continue to produce creative products, based on the knowledge and experience which have been cultivated as IT company. Since its foundation in 1999, ECBB has been involved in more than 3,000 websites/system developments and providing all services required for the successful web business, covering EC website and CMS (Content Management System) development. Also, ECBB established an elementary school in Bangladesh. This is called “ECBB vision” and is based on the concept that business provides solutions to social problems. In the makers department, ECBB MAKERS., launched in 2015, its first product “Palmo” has won the 2015 GOOD DESIGN AWARD (Japan) and the 2017 reddot design award (Germany), its second product “Foldable” has been named as the Featured Finalist of the 2017 International Design Excellence Awards (US), and the both products are now the winners of the 2017 GOOD DESIGN AWARD of the Chicago Athenaeum Museum of Architecture and Design. ECBB MAKERS. will be developing not “commodity” but “product” to the whole world.